In Laos, eating is the most important activity throughout a day. In the local language, it is quite common for people to greet each other by asking immediately, “Have you eaten anything? (“Kin khao laeo bor?”). Laos food is often the subject of many conversations, especially when eating means sharing foods with friends and family. 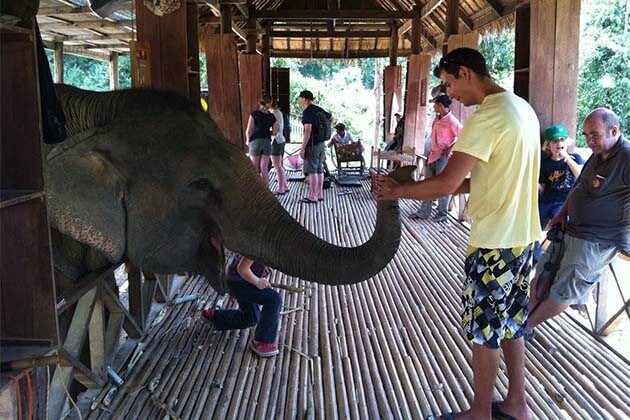 In addition, people take pleasure in sharing Laos traditional dishes with curious travelers. The culture of Laos food is the rich mix of Chinese cuisine and the unique ingredients and seasoning. 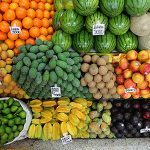 We have compiled a list of the 17 most famous Laos dishes and snacks that you will have to try in local markets or street foods during your Laos tour. Sticky rice is a staple throughout the country. 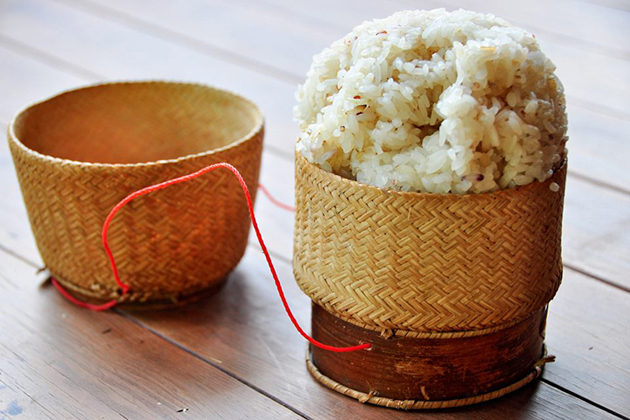 It is commonly said that Laotians eat sticky rice more than anyone in the world. It is traditionally steamed in a cone-shaped bamboo basket, then placed in a covered basket where it is eaten with many other dishes. In Laos, there is always sticky rice available to eat at any time of the day. 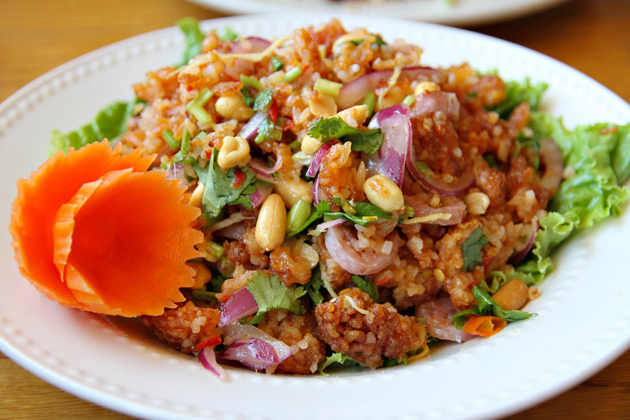 This dish is a type of minced meat salad and it is widely considered as the national dish of Laos. You can easily find Larb made from chicken, duck, beef, fish or pork in vibrant streetfoods. It is usually seasoned with fish sauce, lime juice, fermented fish juice, ground rice, and fresh herb. It is usually eaten with peppers, which you can avoid eating if you cannot consume too spicy food. 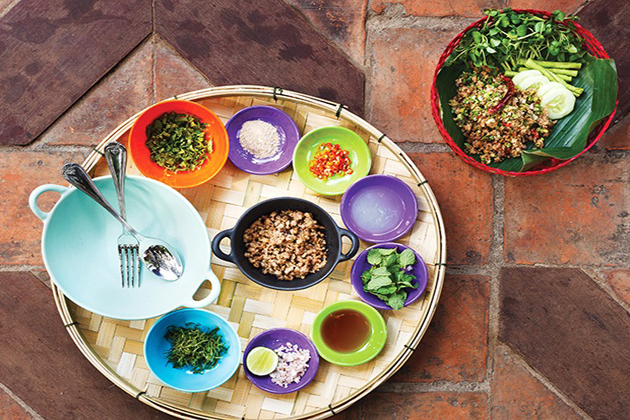 Larb is an essential dish to be combined with Khao Niaw. 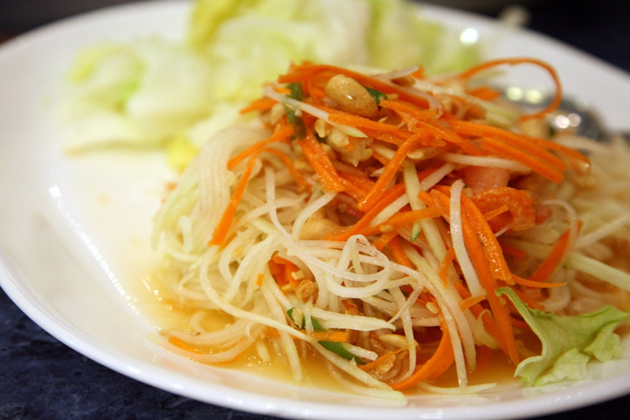 The green papaya salad is usually made from shreds of immature papaya. It is of Laotian origin but can be served in different ways depending on the region. The green papaya salad was imported to Bangkok by Laotian immigrants. The dish is similar to a Som Tam in Thailand, but does not contain peanuts and is usually made with fermented fish sauce. The other ingredients are palm sugar, lime, garlic, tomatoes, dried shrimp, chili, raw eggplant. All these ingredients are pounded in a traditional mortar and pestle. Mok Pa is steamed fish that is usually wrapped in banana leaves and tied with bamboo string. It is prepared with lemongrass, kaffir leaves, spring onion, fish sauce, green peppers, shrimp paste, and fresh dill. All these ingredients are mixed with steamed fish. Mok Pa should never be served dry and it is also another dish that should be used with sticky rice. Khao Piak Sen is a soft noodle soup that is as thick as Udon but is made with rice instead of wheat. 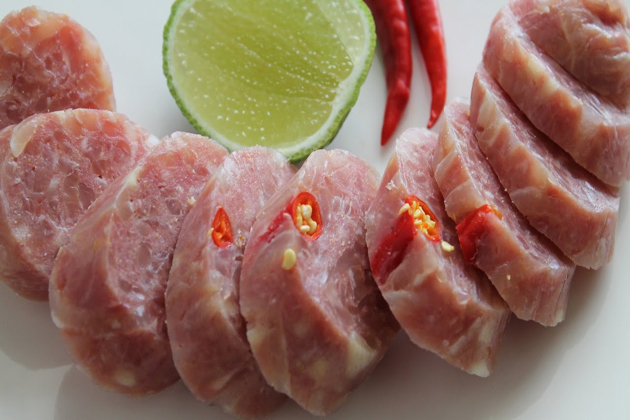 This dish is considered as an easy food in Laos, typically with pork or chicken, lemongrass, galangal, shallots, garlic, chopped coriander leaves, bean sprouts, and served with slices of fresh lime. The most crucial factor is broth which must be cooked slowly with bones for a better flavor. In many restaurants, you will be encouraged to add your own amount of sugar, chili sauce, dried chili powder, fish sauce or soy sauce. This noodle soup is a variation of the Vietnamese Pho soup. It is prepared in beef broth and served with a basket of fresh herb, peppers, limes, and bean sprouts. This is one of the most common soups in the country, and the ingredients vary depending on whether you are visiting Northern or Southern Laos. When ordering a bowl of Pho, you will usually be asked if you want thin or thick rice noodle. After being served, add a little sugar or chili pepper so that the whole will match your taste and enjoy! Nam Khao Tod is a fresh salad from Laos made with fried rice balls, sour pieces of pork sausage, peanuts, grated coconut, fish sauce, dried red peppers, and other ingredients. This dish is traditionally eaten by filling the individual leaf of lettuce with the Nam Khao mixture, topped with fresh herb and dried chili. The Crunchy Rice Salad is usually served as an appetizer and is gradually becoming popular in the West. 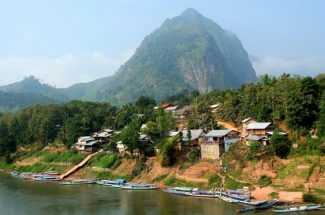 However, we recommend eating this dish with local citizens in Laos for an authentic experience. “Khao poun” is another well-known dish of Laos cuisine. It is based on rice noodles sprinkled with coconut milk broth in which ground pork or fish is cooked together. The broth is spiced up with peppers and crushed peanuts. Chopped vegetables, such as bamboo shoots or banana flowers and other herbs such as mint, coriander, soy are added. 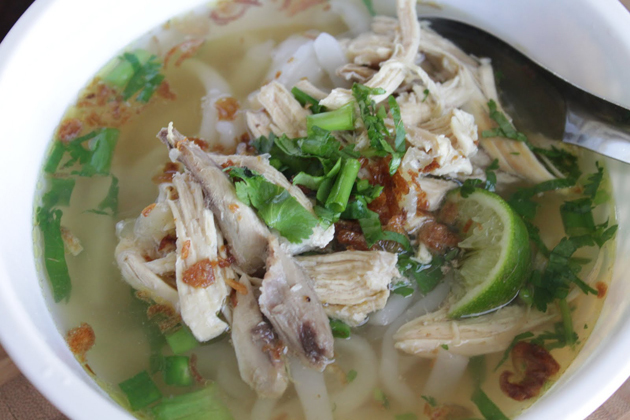 Noodle soups are also popular in Laos. They are served with a plate of lettuce, watercress, mint, slices of lime to add to the soup. 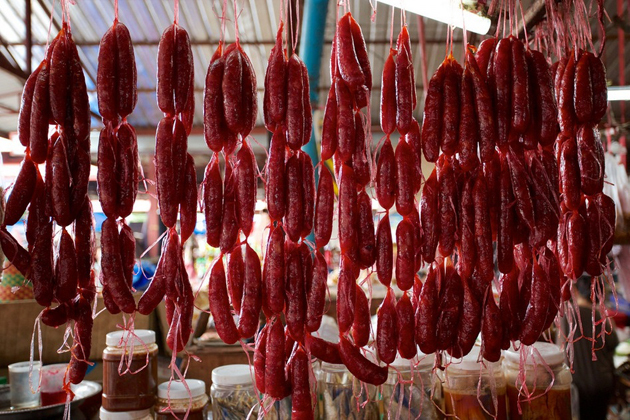 Lao sausages are made with infused meat of herb for a truly different flavor from other sausages that you have tried before. 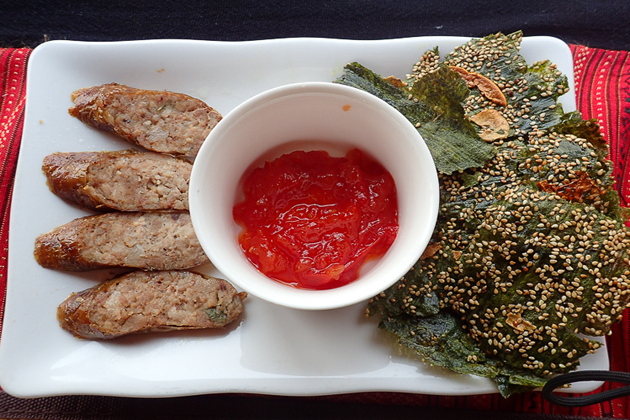 These pork sausages are mixed with lemongrass, galangal, kaffir leaves, shallots, coriander, peppers, and fish sauce. Sausages are essential in many dishes and should be eaten by hands with sticky rice. Original in Luang Prabang, this tasty stew mainly consists of vegetables which are beans, eggplant, lemongrass, basil, peppers, wild mushrooms, coriander, green onions and locally grown vines called “sa kaan”. 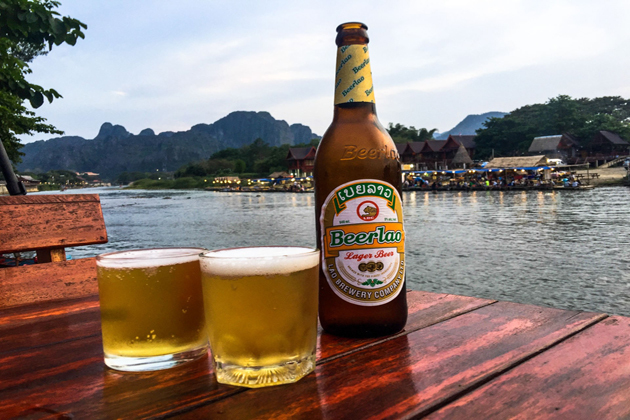 While Laotian beer is not technically food, it is an essential companion to any dish when you stay in Laos. 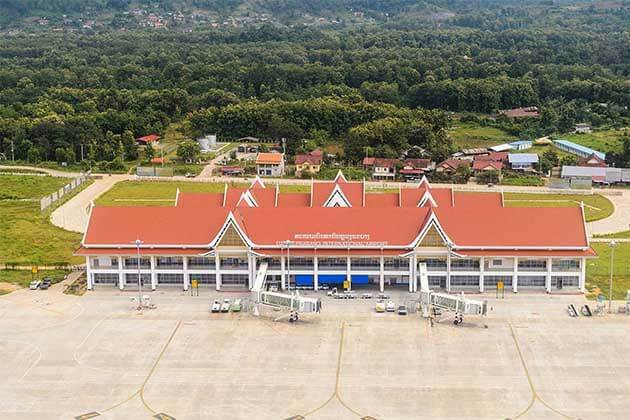 It is the most famous beer brand found in Laos and widely considered as the best-tasting beer in the region. Laotian beer is traditionally served with ice cubes in small glasses when you enjoy it with friends and families. If you are invited for a drink, be ready to finish a little more of the bottle you could expect! Som Mou in Lao (or nam/ naem som Thai), which is fermented pork, is one of specialties in Luang Prabang. It can be served as an appetizer, eaten with sticky rice and coriander or to garnish nem khao. Khao Tom Mad is a delicious traditional Lao and Thai dessert made from sticky rice, banana, coconut milk, all wrapped in a banana leaf. 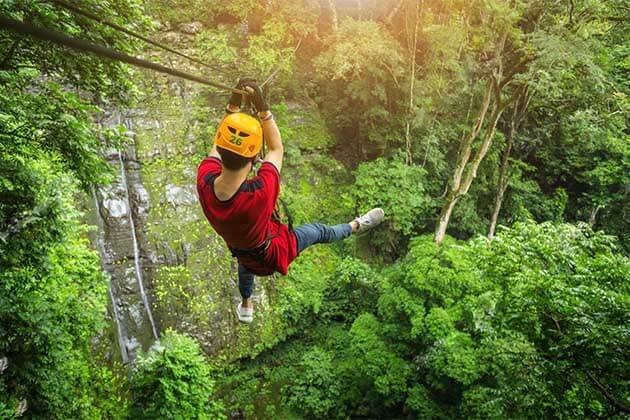 Other names include khao tom mad, khao tom kluai, khao tom phat, and khao tom luk yon. Dishes that are similar to khao tom mad can also be found in the Philippines (known as suman) and Indonesia (lepet). Khaonom mokeng cake is a dessert of Thai origin, from the “traditional cuisine”, is appreciated for its soft texture, creamy melting, and sweet taste. The most of this dessert is the mixture of fried shallot flavor that is sprinkled on top of the cake. 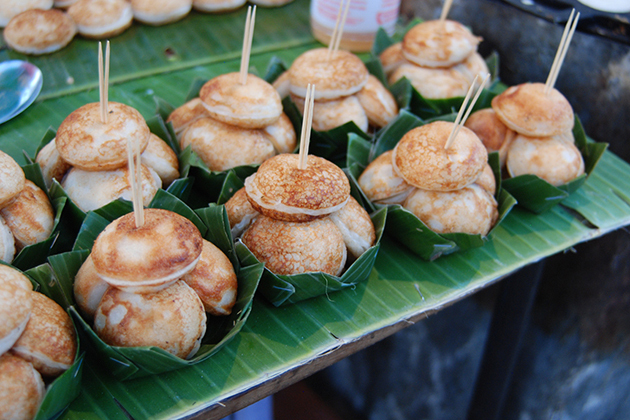 Because of the French influence, many delicious French foods are usually found in numerous streets in Laos. 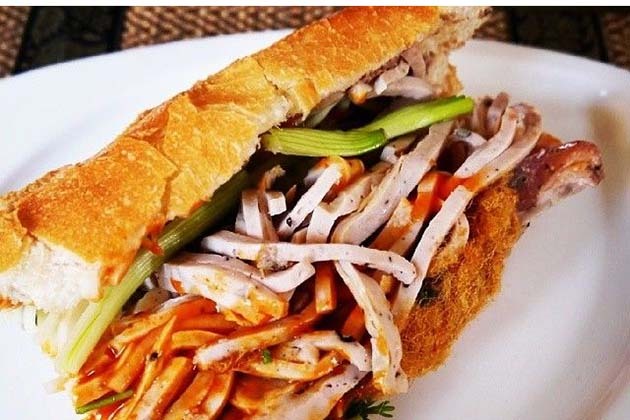 This sandwich looks a lot like the Banh mi of Vietnamese, but instead of using coriander and pickle, the Laotian version consists of watercress, grated carrot, and a certain amount of chili sauce and garlic. It’s a quick meal that can be enjoyed on the road either for breakfast or lunch. A popular snack, Kaipen is made of fresh green seaweed, peppered with sesame seeds and sun-dried in thin leaves. These raw Kaiens are stored in rolls. For consumption, Kaipen leaves are fried in a saucepan and are usually served with jaew bong (chili paste). Sun-dried beef pieces are perfectly consumed with Beer Lao. Made from beef steak (sometimes water buffalo meat), marinated in a mixture of garlic, fish sauce, ginger, sesame seeds, sugar, salt, and black pepper. The strips of meat are then sun-dried and then fried until lightly crunchy and served with sticky rice or jaak maak len (tomato-based chili sauce). 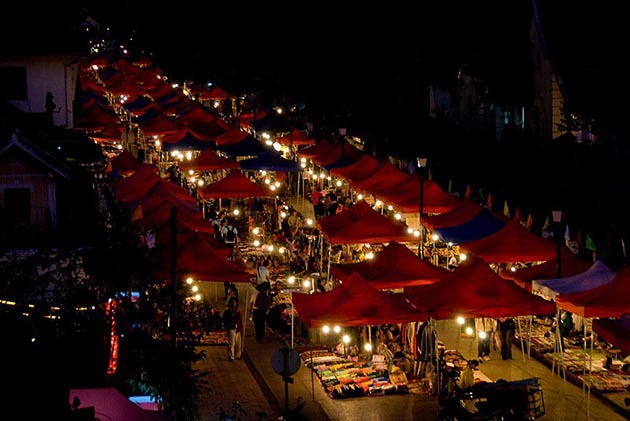 Hope that the list of the best Laos foods and Beverage will be a useful guide for your trip to this beautiful country.